Chennai: About four months ago, in its crawling inefficiency, Tamil Nadu’s Department of Geology and Mining came up with an idea that would set several tidal waves in motion. The idea was a simple one and used to astounding effect in neighbouring Karnataka, but Tamil Nadu – hemmed in by a chief minister who was unwell and the lethargy of five years of indifferent governance – took its own time to wake up and smell the ocean spray. With the umbrella concept of moving the state towards e-governance, the state’s mining department decided to do their bit – by using a system called the Online Mining Tenement Registry – on a pilot basis to find out where illegal mining was taking place. Shortly on its heels, in October 2016, the Government of India’s Ministry of Mines followed suit with its Mining Surveillance System – the satellite mapping of legal mining leasehold areas, in conjunction with the Bhaskaracharya Institute for Space Applications and Geo-Informatics (BISAG) in Gandhinagar. Tamil Nadu chose five districts for the pilot project which would map existing legal permissible mines on record and then look for mining being carried out in areas where no permissions had been accorded. “Eight ‘triggers’ were set off by this process,” a source in the state mining department told The Wire on condition of anonymity. “Of these, we inspected two which appeared to be very large in nature – one in a village called Thiruvembalapuram and another in Vijayapathy, both in Tirunelveli district,” he said. 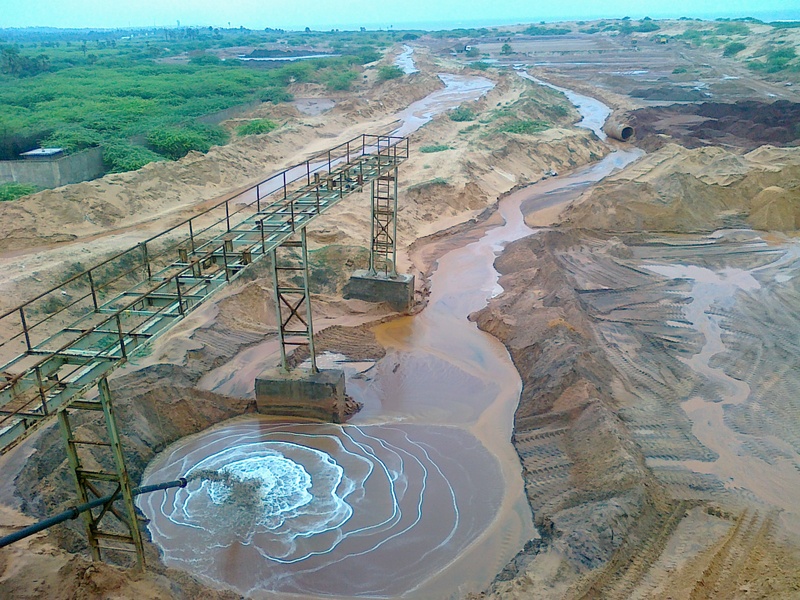 Upon field inspection by the Tirunelveli district administration, the authorities found that illegal mining of sand was taking place over a vast eight hectares in both villages. The deputy director of mines in the district submitted a report stating that 13,70,409.28 metric tonnes (MT) of raw sand and semi-processed sand had been illegally stored in the ‘triggered’ area. Apart from this, a large mineral separation plant belonging to the Industrial Mineral Company was also found to be in operation. The plant separates beach sand – by removing waste and keeping only the mixture of minerals that needs to be extracted separately. Upon further enquiries, the district administration found that the firm does not have any licences or clearances for the plant or to mine. In fact, the company has no mining lease at all in the district. 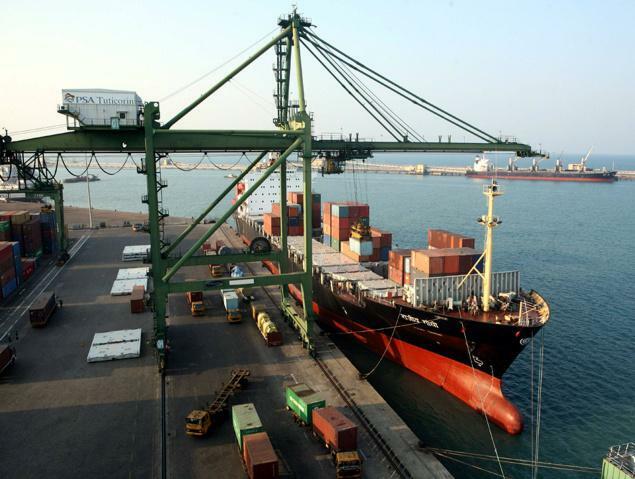 Queries with the Tuticorin Port and Customs authorities revealed that the company had exported a total of 1,87,718 MT of minerals through Tuticorin port from 2012-14 to 2016-17 – again, illegally. Till the time of publication, the Industrial Mineral Company was yet to respond to questions put to it by this reporter. What the Tirunelveli district authorities have now suddenly discovered under their very noses, however, is only the tip of the iceberg. 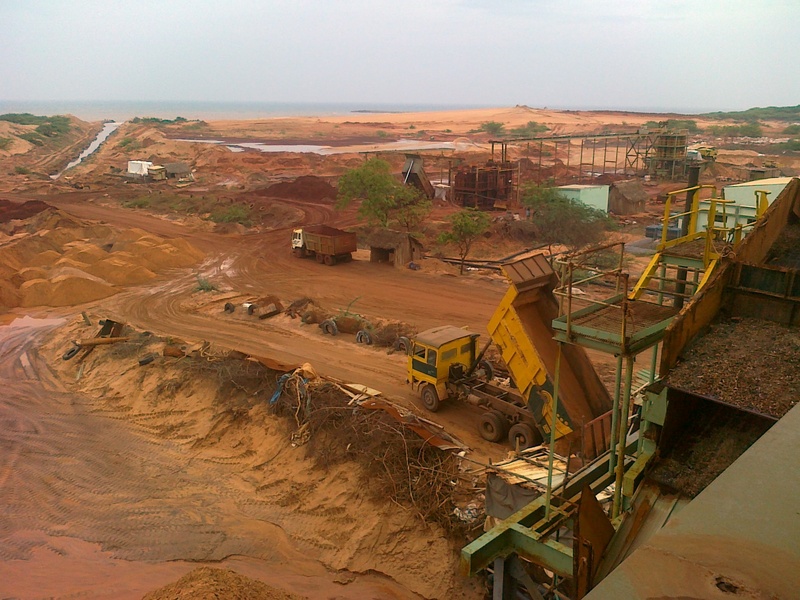 The mining of beach sand is big business in Tamil Nadu’s southern coast. Amidst allegations of loot, corruption and official connivance, as well as bitter internal feuds, one family has built a business empire that holds a monopoly over beach sand mining not just in the state but in neighbouring Andhra Pradesh too. The fact that satellite surveillance can be used to detect and establish illegal mining is likely to have a crucial bearing on a case currently being heard by the Madras high court involving allegations that the illegal mining of beach sand has been going on for years with the collusion of the state and perhaps even central authorities, costing the exchequer tens of thousands of crores of rupees. “Counsel [for the impugned parties] have been dismissing all reports by various agencies which go against them, and claimed that these were due to human bias,” argued amicus curiae V. Suresh, appointed by the high court to help them with the case, told the bench on January 11. “Can a machine be biased? Will they accept if a machine shows illegal mining?” he asked, handing over the damning satellite images to the bench. For close to three decades, beach sand miners of Tamil Nadu have evaded accountability and audits but the sun finally appears to be setting over their fortunes. The official was referring to mining baron S. Vaikundarajan, owner of VV Mineral, the largest sand mining magnate in the country, who is based in Tirunelveli in southern Tamil Nadu. He, along with his brothers and close associates have a stranglehold, a virtual monopoly in fact, over the beach sand mining sector in the country. Official records show that Vaikundarajan owns 53 out of a total of 81 leases to mine heavy minerals in the state of Tamil Nadu through two companies alone. The Industrial Minerals Company, whose activities were spotted by satellite imaging, belongs to Vaikundarajan’s estranged brother, Chandresan. With assets like these, it is no surprise that Vaikundarajan is a powerful – even feared – man in the deep south. But all of a sudden, ‘Annachi’ – elder brother, as he is known locally – and his associates appear to be in trouble. The Centre and the Tamil Nadu state governments finally seem to be taking seriously the blatant irregularities and violations committed along the southern shores of the country. The allegations are numerous and amply documented and are being fiercely litigated in the Madras high court in the form of a suo motu PIL taken up by the first bench. Before the court are major questions: Did the beach sand miners cart away Rs 1 lakh crore worth of rare and precious atomic minerals, as one petitioner alleged? Did state and central government officials actively collude with the miners to sell national resources? Is monazite (thorium) being exported illegally to countries like China and Korea? While we await definitive answers to these questions, what is certain is that laws have been tweaked, ignored, blatantly violated, falsehoods written in official reports, and illegalities which are obvious have been condoned by the authorities at the state and central level. The environment has been destroyed in the miners’ hunger for more money and more power, and the national exchequer drained. The stakes are high when it comes to mining beach sand. The law is complex and should necessarily be unyielding, as it also concerns radioactive material allegedly being mined and illegally exported. The stakes, then, also concern national security. Simply put, what Tamil Nadu has seen is an intricate and astounding story of illegal mining and corruption in which successive governments over the decades have rushed to help the powerful beach sand mining mafia exploit and destroy the southern coasts of the state. 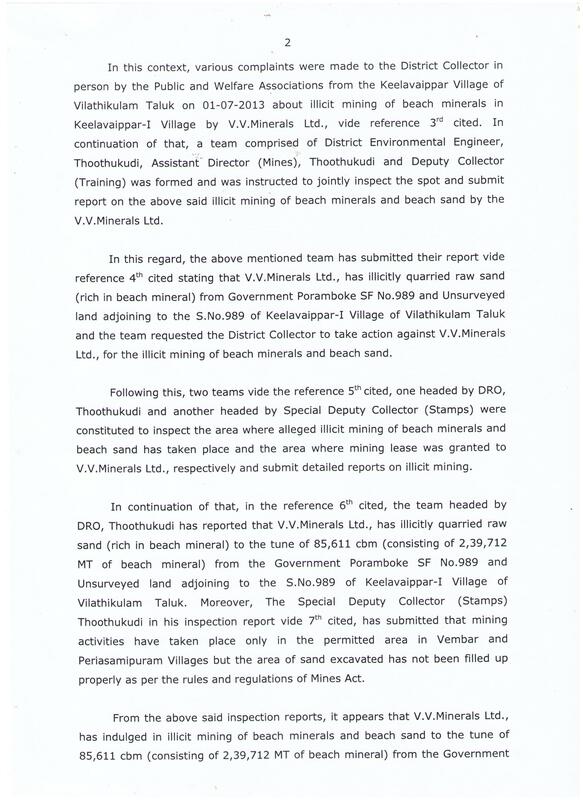 On August 6, 2013, Tuticorin district collector Ashish Kumar was conducted raids on VV Mineral, the beach sand mining company owned by Vaikundarajan. Six hours later, the state government ordered him transferred. Kumar had recommended in his report that the state constitute a special team to probe what appeared, prima facie, to be large-scale irregularities in the mining of beach sand. His recommendation was accepted by the state government, especially given the furore over his transfer. On August 7, 2013, J. Jayalalithaa, who was chief minister at the time, ordered senior IAS officer and revenue secretary Gagandeep Singh Bedi to probe the allegations. A month later, Bedi submitted his report. In September 2013, Jayalalithaa banned beach sand mining in five districts of the state – Tuticorin, Tirunelveli, Kanyakumari, Trichy and Madurai – and ordered Bedi’s team to extend their probe to the other four districts. Since then, the mining of beach minerals has not been allowed in Tamil Nadu despite intense litigation in various courts across the state. But declaring a ban is one thing, enforcing it is another. In fact, beach sand mining never really stopped. As the latest figures from the Tuticorin Port authorities show, close to Rs 40,000 crores worth of beach sand minerals have in fact been openly exported between September 2013 and 2016. In July 2016, two FIRs were filed by the Thattarmadam police in Tuticorin. The police had caught two trucks carrying sand, mined using JCBs in Sattankulam. According to the FIR filed on July 8, 2016, the JCBs and trucks belonged to the Beach Mineral Company. Although the FIR has only the names of the truck drivers, an innocuous insertion has been made against the owner of the company BMC – Sukumar, brother of Vaikundarajan . No action has since been taken on the FIR. Another FIR has also been filed for a similar seizure in Cheranmahadevi, Tirunelveli district in August and the owner of SMV has been mentioned in that FIR. SMV is owned by Vaikundarajan. With this, the state government itself has confirmed that illegal mining of beach sand continues to take place despite Jayalalithaa’s ban order. “We are legally proceeding in this matter and we have issued orders for stopping the mineral separation plants since they have been running these plants without obtaining the proper licences as per the Panchayat Union Act,” the collector, M. Karunakaran told The Wire. The orders issued against VV Mineral points the finger of blame at the panchayat president of Levinjipuram for conniving with the miners. The miners went to the Madurai bench of the Madras high court thereafter, stating that they had paid the requisite fees for renewal of licences to run the factories and that the state government’s 2013 ban did not state that the mineral processing factories had to be shut down. The district administration responded that fees paid to the panchayat council without a valid licence does not count – running the factories without a proper ‘running licence’, in some cases, since 1999, is against the law. Justice Vimala, who heard the case in the Madurai bench, issued a “status quo” order until the case is heard and decided. The district administration says the factories continue to function and are awaiting the next round of hearings in which they hope to put up a strong case. Collusion of Central authorities too? One crucial question that will be asked by the state government in the next hearing in this case pertains to Gazette notifications issued by the Commissioner of Central Excise under the union finance ministry in November 1999 and in June 2011. The 1999 notification declares that the entire village of Karaichuthu Pudur is a “warehousing station” for “setting up a 100% export-oriented unit undertaking”. The 2011 notification says the same for the village of Keeraikaranthattu in Tirunelveli. The state government is gearing up to ask the union finance ministry how an entire village can possibly be notified as a warehousing station – that too, without naming the company that it is a warehousing station for. “Any such notification must specifically state the particular place, for example specific survey numbers or specific areas containing specific boundaries,” said a senior state government official in the know about this issue, on condition of anonymity. “An entire village cannot be notified as a warehousing station. A village has houses, hospitals, roads, churches, temples and agricultural lands. This is misuse of the powers of the board. The notification is ridiculous and made without any application of mind,” he said. On November 9, 2016, orders were issued by the district collector of Tirunelveli following a series of meetings of the district level committee on prevention of illegal beach sand mining and transportation of beach sand minerals, held at the collectorate. The minutes of these meetings held on October 18 and later on November 9 record the fact that all the various beach sand mining firms have indulged in vast illegal mining and exports, despite the ban on the same by the state government in 2013. The document also goes on to say that “S. Jegatheesan partner of M/s VV Minerals, by accepting the guilty [sic] of illegal mining presented a petition dated 12.08.2016 for compounding the offence and the same was rejected by the district level committee. This act of submission of petition for compounding itself proves that the company is included in illegal mining and transportation of beach sand minerals.” The district collector recommends in his orders that the state government transfer the cases of illegal mining to the CB-CID, an elite special task force of the state police. In his affidavit before the Madras high court in the PIL, though, Vaikundarajan of VV Minerals has stated that all of his factories have been shut since September 2013. 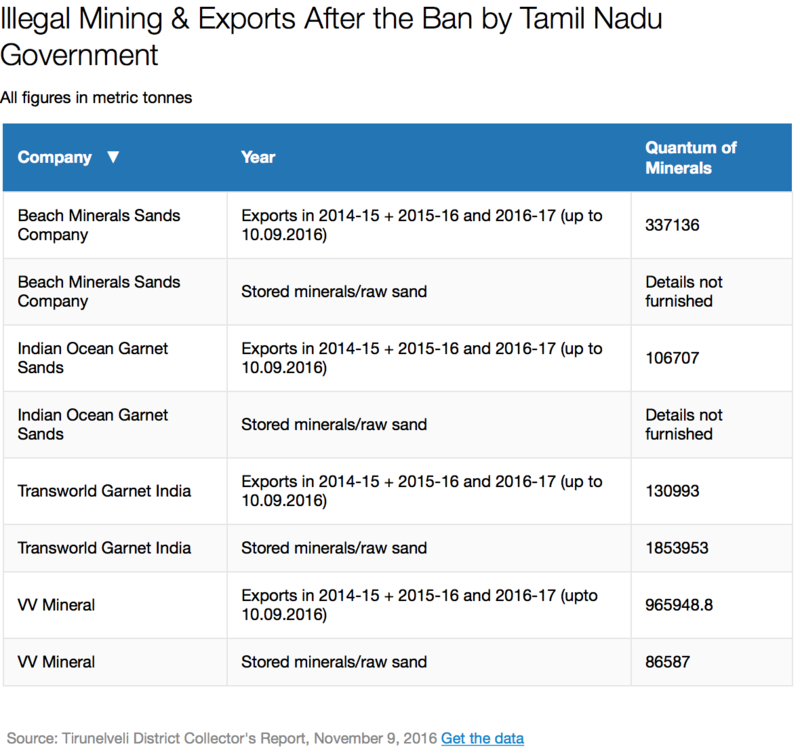 On November 9, 2016, the Tirunelveli district collector wrote to the Tuticorin Port authorities questioning how they had allowed exports of beach minerals by various companies, despite this being banned in the state. 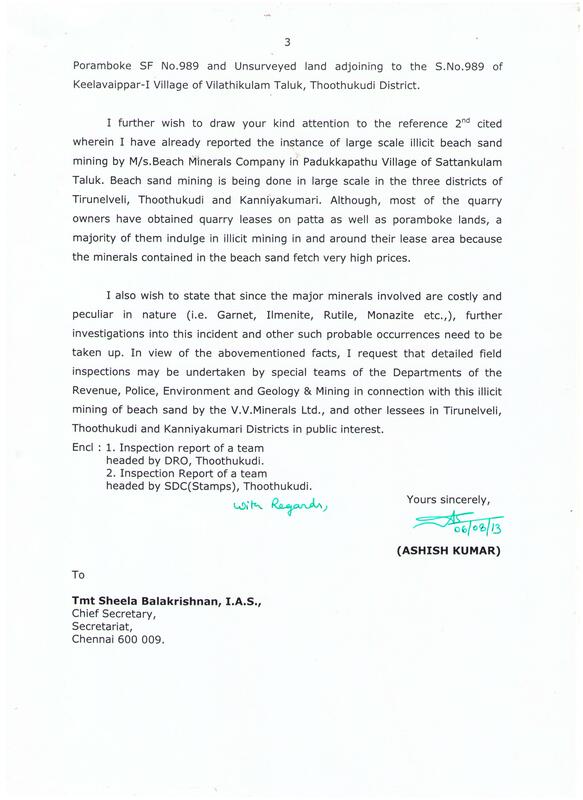 The Tuticorin Port issued a carefully worded circular on November 23, 2016, in response stating that anyone wanting to export beach minerals herefore, must produce a certificate from the district collector stating that the minerals to be exported have not been illegally mined. Now that the Tuticorin Port was out of bounds for the miners, their illegally mined sand and minerals were moved to another port. “It is learnt that a truck carrying 21 tonnes of ilmenite was seized in Shoolagiri in Krishnagiri district and FIR in Crime No. 514, dated 07.12.2016 was registered by the Shoolagiri PS. The consignment was sent by M/s VV Minerals to a consignee address in Bellary, Karnataka. It is learnt that since necessary despatch slips and bulk permits were not shown, the entire stock of minerals and vehicle was seized,” said the amicus curiae in a memo filed on January 11, 2017. In a separate development, an RTI petition filed by Vaikundarajan’s estranged brother S. Kumaresan with Tuticorin port has yielded details that are hard to ignore. 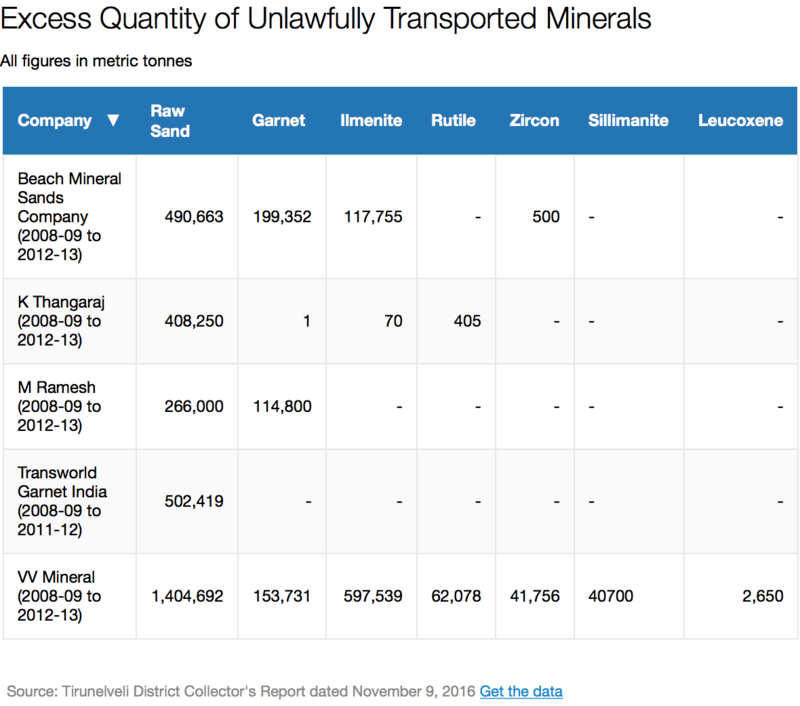 The RTI data shows clearly that exports of heavy minerals – ilmenite and garnet – have been taking place despite the ban of September 2013. Since October 2013 until May 2016, close to 15 lakhs MT of heavy minerals – both ilmenite and garnet have been exported by the major beach sand mining companies. The argument of the miners – that they were only exporting minerals already stocked in their godowns – is weak at best. Exports cannot be allowed without a transport permit issued by the district collector. These transport permits have a validity of three months at the most. But exports have taken place in late 2016 too, well after the ban. Tamil Nadu laws also do not allow the storage of any mineral except beach sand. So what happened? Did the district authorities issue transport permits, flouting the ban? Or did the port authorities allow these exports to take place without asking for a transport permit? The Madras high court, in its orders dated November 21, has impleaded the customs and excise department in the case and also given time for the miners to respond to the 100-page status report submitted by the amicus curiae. How the central customs and excise department was unaware of a state government ban on mining and export of beach sand for three long years is a mystery waiting to be unearthed. Another request made by the amicus curiae in his status report filed before the Madras high court is that all litigation in various courts pertaining to beach sand minerals be brought to the bench and disposed of together so that there may be no conflicting judgements by different courts, a situation that the miners have continually exploited to their advantage. A mind-boggling number of lawsuits have been filed since the Tamil Nadu government’s ban on beach sand mining in the state by the miners in various courts across the state. At every step of the way, when the centre or the state attempt to rein in the miners, smaller courts come to their aid quickly, often due to the magistrate’s lack of understanding of a complex policy framework and a series of half truths and blatant falsehoods continually submitted by the miners in courts. As per the status report, there are currently 59 cases filed willy nilly by miners in the district courts of Tirunelveli, Kovilpatti and the Madurai bench of the Madras High Court, apart from the PIL. Of these, the amicus curiae notes that details of at least 21 cases were not made available to him. The state prosecution too is floundering. “We do not understand what is going on,” said a member of the state prosecution team. “We ourselves are not getting the details of all lawsuits filed in various courts. These miners are too powerful and we are being blocked at every step of the way,” he said. Another important point in the orders passed by the Madras high court on November 21 is that the state government has been asked to submit the report by Gagandeep Singh Bedi on illegal mining in the districts of Tirunelveli and Kanyakumari. So far, Bedi’s report – triggered by the then Tuticorin collector Ashish Kumar’s original call for a probe in August 2013 – has not yet been made public. Vaikundarajan of VV Mineral refused an interview to this reporter. But in an interview to the Times of India on November 24, 2016, he denied all allegations against him. The Tirunelveli district collector’s orders of November 9, 2016 categorically refute this claim. The procedure for mining and export of beach sand minerals has three phases. Once the sand is scooped up to be taken to the pre-concentration plant, the miner has to obtain a document called Gate Pass I. From there, the concentrated mineral-rich sand is moved to the separation plant so that heavy minerals garnet, ilmenite, rutile etc may be removed separately for export. For the journey to the separation plant, the miner requires Gate Pass II. Once these heavy minerals are separated and packed for export, it may be moved to the nearest port only on obtaining a transport permit from the district collector. “VV Minerals has not been issued with any Gate Pass-I or Gate Pass-II or transport permits for transportation of raw sand, pre-concentrated sand and separated minerals after the stopping of mining operations by the (state) Government (in 2013)… Therefore, the entire quantum of minerals transported without obtaining transport permits after the stopping of mining operations is illegal transport,” says the Tirunelveli district collector’s report. In fact. the complicated framework of rules by both centre and state in the case of beach sand mining is very clear on that issue – there certainly is an approved quantity of minerals that the miner needs to stick to. Excessive mining, over the quantum approved by various authorities, is illegal in India. High stakes illegality cannot be accomplished without the active collusion of government officials, especially when the mined substances are bound by intricate and stringent laws. At every step of the way, from preparing a mining plan to exporting the mined minerals, what is evident is the collusion and oversight, whether deliberate or accidental, of multiple officials within the state government of Tamil Nadu as well as successive governments at the centre. 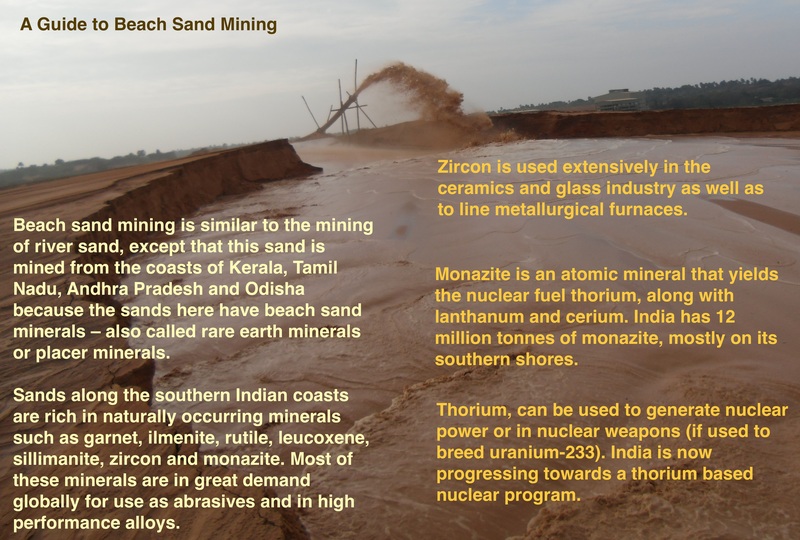 Until 1993, the position of the Government of India was that no private player would be allowed to mine these beach sand minerals (BSM). From 1993 to 1998, the sector was partially opened up to private participation, with mining of garnet and sillimanite being allowed. Since all minerals existed as a mixture in the coastal sand, private players mining garnet and sillimanite, after separation of these, had to return the remaining minerals to Indian Rare Earths Limited (IREL), a central government undertaking. On October 6, 1998, a notification was issued by the Department of Atomic Energy modifying the policy on exploitation of beach sand minerals. Private players were now allowed to carry out mining of ilmenite, rutile, zircon and leucoxene. Only monazite was not allowed to be mined by private players due to its strategic national importance. These details have been submitted by the DAE in the Chennai high court in an affidavit dated August 25, 2015, as part of the PIL currently being heard. Since these minerals (excepting garnet and sillimanite) were classified as ‘atomic minerals’ under the Atomic Energy Act of 1962, the central government had sole control over approval of licences to mine them. Hence, a complicated structure of licencing was devised – once the miner applied for licences to mine any of these minerals, the state had to verify the land documents, issue a mining lease and forward it to the centre. A mining lease alone did not mean that the miner could begin operations. An additional process of getting a mining licence from the centre remained. If the mining licences were only for garnet and sillimanite, licences and mining plans would be approved by the Indian Bureau of Mines. If the mining licences included ilmenite, rutile, zircon and leucoxene, the Atomic Minerals Division under the Department of Atomic Energy would give approvals. Monazite continued to be a strict no-no for private miners. Although most mining licences were approved for a period of 20 or 30 years, the state government had to renew the mining leases every five years. But since monazite too was mixed into the sand and would emerge as a by-product of mining the other minerals, an extra procedure was added to enable the government to ensure that monazite was not carted away on the sly. A ‘handling licence’ for monazite, as well as the other atomic minerals, had to be issued by the Department of Atomic Energy to miners wishing to process the other atomic minerals. The monazite that resulted from the separation process – called monazite tailings – would have to be stored in concrete lined pits with specific parameters and accounts of this stored monazite would have to be sent once every three months to the DAE. The DAE would also conduct inspections of the site where this monazite was stored. 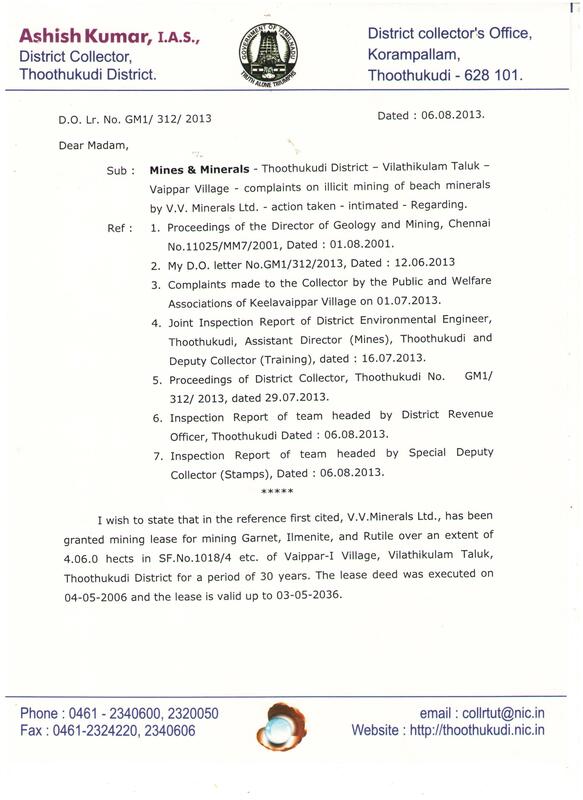 Documents available with The Wire show clearly how the Tamil Nadu Geology and Mining Department added ‘monazite’ in at least 16 mining leases of a private miner, VV Mineral, while performing its periodic 5-year renewal of mining leases. A verification of the original approval issued by the centre shows that monazite is not part of the original licence. The state also affixed royalty to the atomic mineral, tacitly allowing the sale and/or export of the mineral. In January 2015, a PIL was filed in the Madras high court by geologist – and one time Vaikundarajan rival – Victor Rajamanickam, alleging that illegal beach sand mining had caused a loss of over Rs 1 lakh crores to the exchequer. The petition pled for a Special Investigative Team to probe into the same. The Chennai high court dismissed his PIL the same month but, considering the seriousness of the issue, took up the case suo motu with Chief Justice Sanjay Kishan Kaul and Justice Mahadevan hearing the case since. The state industries department further went on to argue that giving a licence to mine monazite was not equivalent to allowing export of the mineral and that conditions while granting the licence to mine monazite were the same as those imposed by the DAE. 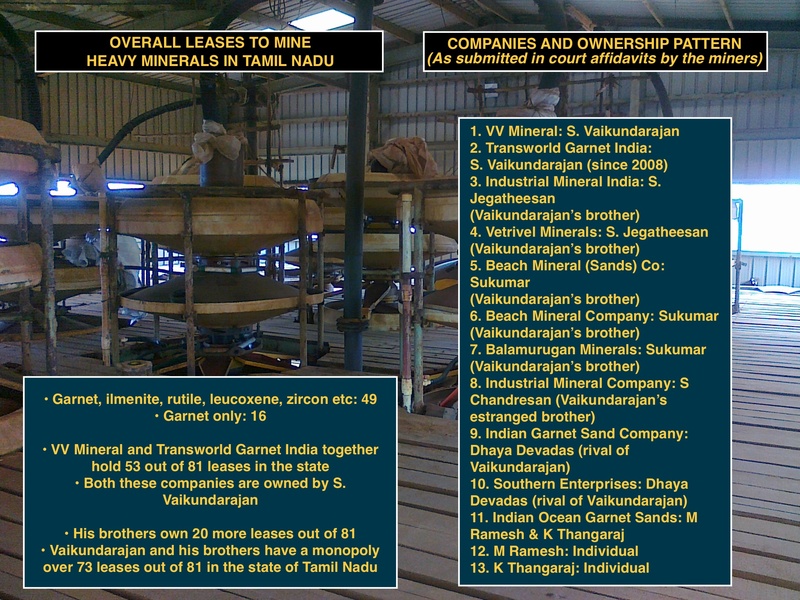 All of these 18 licences to mine monazite were issued to one company – the largest player in the beach sand mining space, VV Mineral, the firm owned by S. Vaikundarajan. But inside court, the legal blame game began only in July 2016. During a hearing, when counsel for VV Mineral Gopal Subramanian was asked about the inclusion of monazite in the mining leases, counsel argued that the state government suo motu added the mineral in the lease without the company asking for it. But the state government’s position in the legal affidavit is otherwise – that they granted the licence to mine monazite due to VV Mineral asking for it. Apart from this, the company has also filed two cases in the Madurai bench of the Madras high court in 2013 against the Department of Atomic Energy for refusing them permission to mine monazite – showing that the firm is indeed interested in mining monazite in order to export rare earth oxides. As the courtroom drama progressed in the PIL, a series of interlinked events took place within the state government of Tamil Nadu. On August 3, 2016, at 11.30am, a meeting was convened in the chamber of the secretary of environment and forests of the state within the secretariat complex at Fort St George. The Tamil Nadu State Coastal Zone Management Authority was holding its 90th meeting. As the meeting progressed, two people in the room began to protest vociferously. The bone of contention was over item number 9 on the agenda – a proposed “specific (mineral based) SEZ including captive (minor) port at Thrivambalapuram village” in Tirunelveli, to be set up by VV Mineral. The firm had requested CRZ (coastal regulatory zone) clearance for this project planned over an area of 165 hectares. The minutes of this meeting show the nature of the project: “Heavy mineral processing plants (cracking of monazite) for throughput quantity will be 90,000 TPA out of which 50,000 MT of rare earth oxide and 40,000 MT titanium pigment and zirconium products, in non-CRZ area,” it read. This project, shockingly, was not shot down; rather, the CZMA recommended that the centre clear it. Despite his plea, the status quo continues and no private player can process monazite. How then did the state government even consider this proposal, is a question that begs asking. Soon after that meeting in the secretariat came a series of mystifying events. In the company’s defence, VV Mineral’s counsel in mid-August submitted a fresh report by the MoEF, submitted to the Centre in 2015, which gave a clean chit to the company. On August 26, 2016, advocate general A.L. 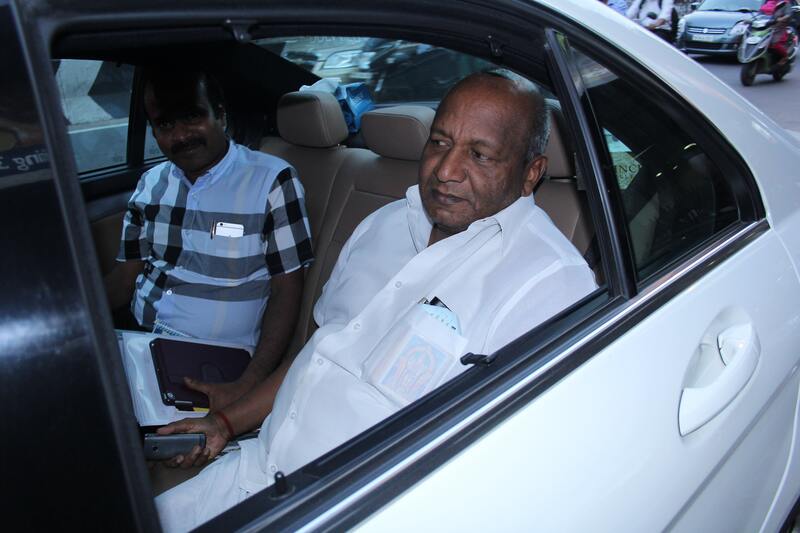 Somaiyaji suddenly resigned from his post and the state appointed R. Muthukumaraswamy as his successor. Somaiyaji could not be reached for comment on his move. Somaiyaji had represented VV Mineral and other miners as their counsel in 2006 and 2007. In June and July 2016, Somaiyaji, as advocate general, appearing for the state government, had maintained that no report had been submitted by the special committee led by Gagandeep Singh Bedi to the state in 2013-14 detailing the probe into illegal beach sand mining that Jayalalithaa had ordered. Three days later, on August 29, Jayalalithaa suspended eight officials, among them a former chief secretary and the then commissioner of geology and mining, Atul Anand. Other suspended included six officials of the mining department and the TNPCB (Tamil Nadu Pollution Control Board), who had been part of an 11-member committee that submitted the 2015 report to the MoEF. With the appointment of Muthukumaraswamy, the tide has turned in the PIL. The new AG reversed his predecessor’s stand, admitting to the bench in open court that the Tuticorin report of the special committee headed by Bedi had in fact been submitted to the state government. Bedi’s report has since been handed over to the bench, although it remains confidential. The miners are in a fix now. Both the centre and the state have begun to choke their businesses. But Vaikundarajan will not go down without a fight. After all, he and his associates have used their political and financial clout to get their way for three decades.